Tecore is the world leader providing Network in a Box® (NIB) architecture that pioneered the delivery of all-in-one wireless systems ideally suited for remote operations, military deployments, and private networks. The NIB product line which includes numerous packaging options provides the flexibility for targeted markets and applications to deliver big network capabilities in a size optimized package. Network in a Box® (NIB) solutions provide easy-to-use, rapidly deployable communications, addressing the need for mission critical, turnkey network coverage in the field. 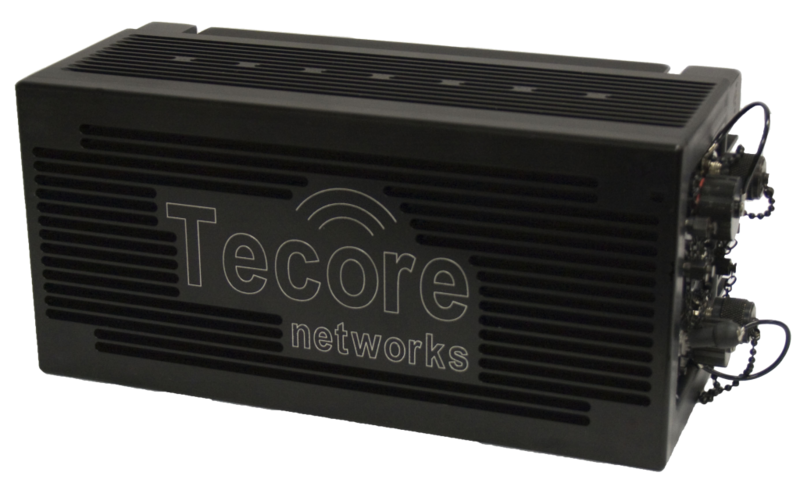 Tecore’s iCore® Network in a Box®(NIB) is a robust all-in-one, portable integrated hardware and software box which is capable of supporting an LTE Core Network, IMS-Core in addition to an eNodeB and Remote Radio Head (RRH). Providing highly operational availability through continued LTE coverage in a small, compact, portable form factor to meet critical public safety needs when backhaul connection to the Macro EPC is lost. A number of broad deployment scenarios include extreme disaster, special rescue missions, emergency management, armed forces, peace keeping missions and mobile communications networks in transit. The iCore NIB provides voice, text, video and packet data services through standards based network elements developed to relevant 3GPP standards. Residing in the iCore NIB are Virtual Machines (VM) that include Network Core, IMS-Core, Base Band Unit (BBU) and Remote Radio Head (RRH) elements. This nodal component of the Evolved UMTS Radio Access Network (E-UTRAN) provides a seamless LTE network solution. These enhanced integrated techniques translate into better quality of service and higher bit rates for packet data-intensive applications in addition to being lighter in weight. With this flexible architecture supporting network functions virtualization, the iCore NIB can be deployed quickly to meet the operator’s requirements in broad deployment scenarios. Isolated Operations for Public Safety (IOPS) capabilities has been defined by the larger wireless community to specifically address the operational requirements and configurations of tactical LTE systems for public safety. As a compliant system, Tecore’s IOPS Network in a Box® (NIB) allows for the rapid deployment of LTE services capabilities to an impacted area. The all-in-one, transportable and ready-in-minutes network solutions capable of supporting an LTE Core Network IMS-Core in addition to an eNodeB and 2×20 watt integrated Remote Radio Head (RRH). By delivering multiple access technologies and streamlining the network through an IP-based architecture, it provides responders with the most compact, adaptable, and cost-effective platform for rapidly deploying. This new breed of Cell on Wheels (COW) or Mobile Cell Site is optimized for the LTE environment and can be adapted for integrated, mesh or standalone communications. Residing in the IOPS NIB are Virtual Machines (VM) that can be integrated with Tecore’s Base Band Unit (BBU). This nodal component of the e-UTRAN provides a seamless LTE network solution. These enhanced techniques translate into better quality of service and higher bit rates for packet data-intensive applications. With a flexible architecture supporting network function virtualization and scalability from fewer than 100 to tens of thousands of mobile subscribers, the IOPS NIB can be deployed quickly to meet the customer requirements in multiple deployment scenarios. 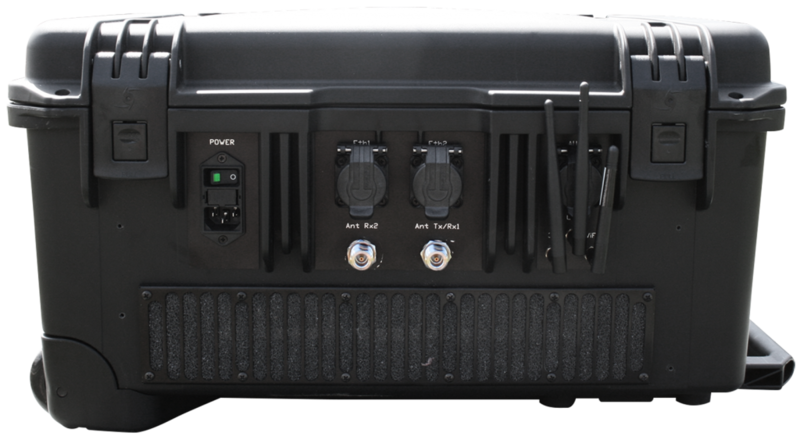 Tecore’s LYNX™ Network in a Box® provides a rapidly deployable, high-speed, 4G LTE communications network to support Defense, Public Safety, and Security Force Operations. Addressing mobile environment installations for land, air, sea and on foot and unmanned systems the LYNX can network together, providing mesh communications, thus expanding the footprint coverage of the system. As a standalone network, the LYNX can provide network coverage in rural and remote areas without any existing infrastructure. A fully integrated, self-contained, LTE Network in a Box® (NIB), the LYNX is an all-IP solution delivering a compact, adaptable, and cost effective end-to-end 4G LTE network. Included in its design is an integrated EPC, eNodeB, radio, and processor capable of delivering high-speed voice, text, and packet data services to users operating anywhere in the world. It can also integrate into existing customer networks, bringing secured, high speed 4G LTE network extension capabilities to tactical operations centers, forward operating bases, mobile and emergency response units. Designed to meet strict MIL-SPEC standards, the system is compact enough to be carried into a vehicle, mounted to the interior of the vehicle, or small enough to be positioned as a man-packable deployment. 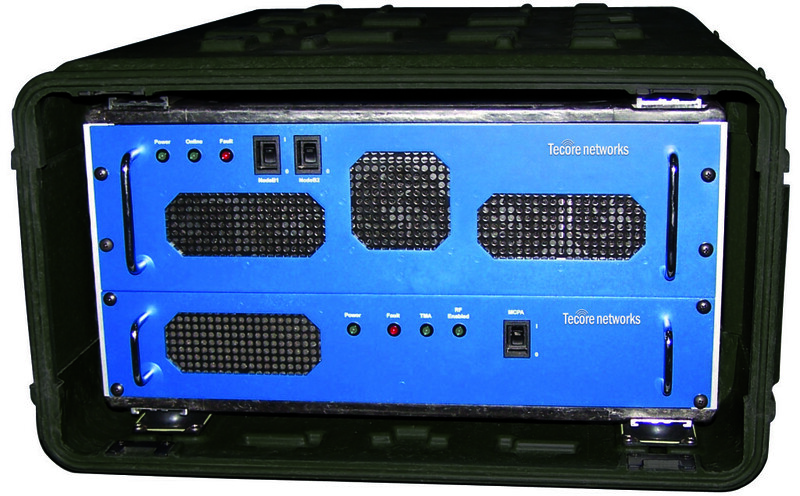 Tecore’s RAVEN® Platform delivers macro 3G wireless service for rapidly deployable communications. The RAVEN leverages a size-optimized all-IP based architecture, delivering a compact, adaptable, and cost-effective rapid response platform. The highly portable, mobile platform is small enough to qualify as carry-on luggage on most airlines measuring approximately 2 cubic feet. The RAVEN system is capable of supporting UMTS and HSPA and provides voice, text, and packet data services for local users as a standalone system or as part of a larger communications network. Multiple RAVEN platforms can be networked together to provide end users with ubiquitous access from site-to-site, as well as accessing international voice calling services, the Internet, and social media locally or through a centralized gateway on a 3G network. Tecore’s iCore® 3G Network in a Box® (NIB) leverages a size-optimized all-IP based architecture and is capable of supporting UMTS and HSPA. The NIB provides operators with a compact, adaptable, and cost-effective platform for deploying, extending, and evolving their networks. With a flexible architecture supporting network function virtualization and scalability from fewer than 100 to 1,000’s of mobile subscribers, the NIB can be deployed cost effectively to meet the customer requirements in multiple deployment scenarios. The NIB is a robust all-in-one integrated solution (Core Network and RAN) enabling comprehensive management and operations of network and has been successfully deployed in commercial, government, and private networks on a global basis.